Many of you are well versed in reading, navigating, and taking full advantage of blogs. This post is intended to help those of you who are not as experienced. Hopefully, some of you who are more experienced with blogs will point out any other tips or tricks that are not mentioned here. The important parts are numbered and an explaination follows each screenshot. 3. The widget tab is basically a duplication of the options you see down the right side of the page. If you click this tab, it will give you the option to click on links to “blogs I follow”, archives, and categories. 4. 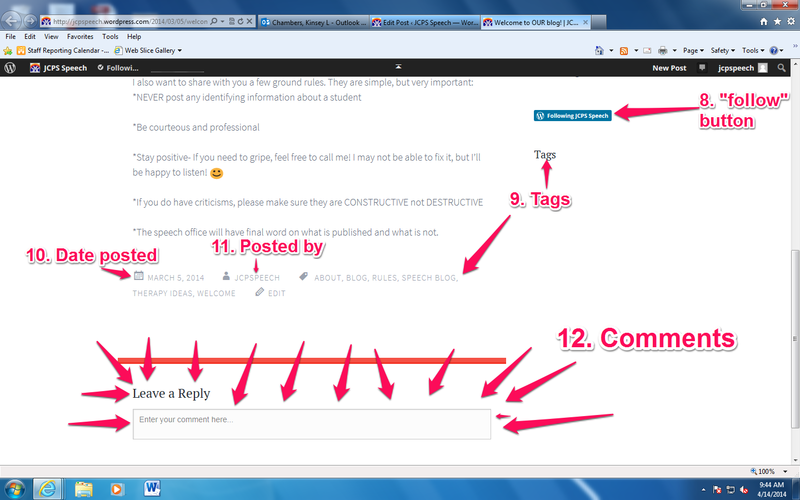 The magnifying glass allows you to search within the blog. For example, if you want to find information about language, you would type “language” into the search bar and it will pull up all the places within the blog where the word “language” appears. As you can see, there is also a search bar on the right side of the page. Both options function the same way. 5. The “Blogroll” is a list of useful links. Currently, there are links to KSHA, ASHA and JCPS sites. More may be added periodically. 6. The “Archives” heading shows a list of previous posts. The titles listed are linked to the actual post, so you can click on the title and it will take you there. 7. The “Categories” heading allows you to choose from a list of categories. You can click on the category you are interested in and it will take you to the related pages/posts. 8. The “Follow” button allows you to quickly follow the blog. When you sign up for this feature, you will receive e-mail notifications of new posts. 9. Tags are similar to categories, but more specific. You can click on any of the tags to find more information about that topic. 10. This is another one that is pretty self-explanatory. It shows the date that the corresponding post was originally published (posted). 11. 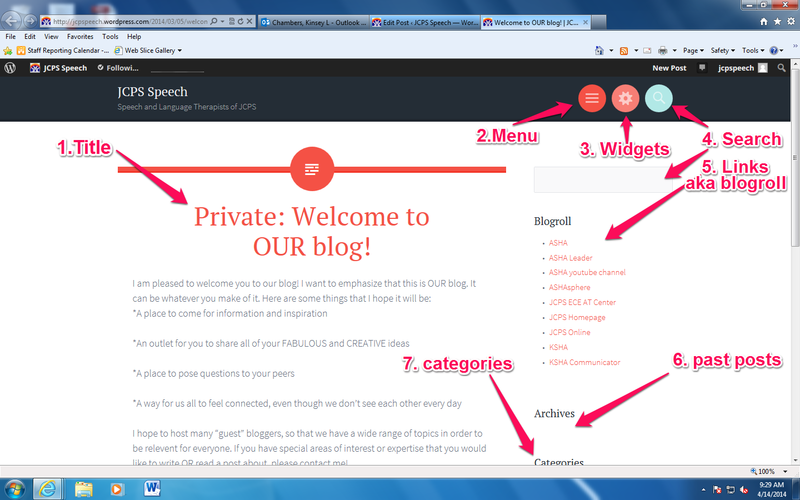 Some blogs have multiple contributors that are able to publish, but for this blog, it will always say: JCPSPEECH. 12. Can you tell what is the most important part? This is one way you will be able to contribute your thoughts and ideas. When you make a comment, it will give you the option to check a boxes indicating “Notify me of follow-up comments via email” and “notify me of new posts via email” so that you can follow the discussion that happens after you comment. Remember to keep comments positive. This is a forum for team building and collaboration, not to voice concerns or negative comments. Comments are reviewed before posting. Are there things that are left out of this tutorial? Are there things you are still confused about or things that you already use that are not included? Let me know what you think!